Canine skin cancer, with tumors that affect the skin or the tissues under the skin, is the most common kind of cancer seen in dogs. 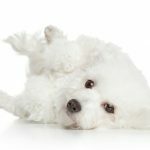 The Bichon Frise dog is among the top 10 dog breeds that get cancer, so as Bichon owners, we need to pay attention to any bumps, lumps or irritated areas on the skin of our dogs. Identifying skin cancer in dogs can be tricky. Your vet will need to decide if your dog actually has canine skin cancer. If your dog has anything new on her skin, you need to pay attention to it. Canine skin cancer can be really hard to distinguish from other lumps that are not harmful. Even your dog’s vet may not be able to tell if a bump is cancerous, without looking under the microscope at a tissue sample. Perhaps the reason that skin cancer in dogs is the kind of cancer most often diagnosed, is that we can see changes on the skin of our dogs. And your dog just can’t tell you what she feels like inside! How is Skin Cancer in Dogs Diagnosed? How is Canine Skin Cancer Treated? Skin cancer is seen in some dog breeds more than others. In addition to heredity, we know that exposure to chemicals, sun damage and viruses can also play a part in whether your dog gets skin cancer or not. All dogs can get skin cancer. And certain types of cancer are more common in some breeds than others. While Bichon Frises do have longer hair that protects them from the sun, they are still quite prone to different types of cancer. 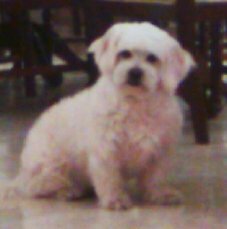 Older Bichon Frises like this one tend to have more skin cancer than younger dogs. Mast cell tumors are the most common skin cancer tumors that we see in dogs. They are somehow linked allergic reactions, and they produce histamine, which we know is produced as a reaction to an allergen. Because they are connected with allergies, Bichon Frise owners should be especially alert for this type of tumor. Additionally, about 25% of dogs with mast cell tumors also develop an ulcer, caused by release of histamine from the tumor. Mast cell tumors cause itchiness and irritation. They are seen most often in older dogs, aged 8-10 years old, especially in mixed breeds. 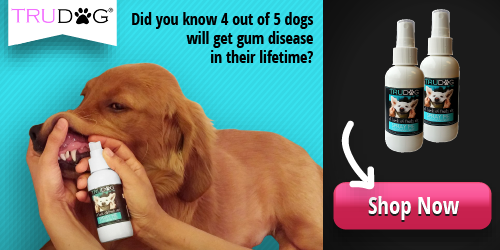 And they can develop anywhere on the skin, but also inside your dog’s body on his internal organs. Most commonly, you may see them on your dog’s legs, chest or tummy. But sometimes they are found on a dog’s head or neck. Mast cells are strange looking. They have a central lump or tumor that is surrounded by a circle of smaller mast cells. But they can also look like a swelling under the skin, a fatty cyst, a pimple or rash or a wart. If mast cell tumors receive treatment, they can be put to rest, but untreated mast cell tumors are fatal. Melanoma is not always cancerous. Canine melanoma, or melanocytoma, can also be benign. In fact, most often it is benign, or not cancer. Canine melanomas are seen most often in middle-aged or older dogs, and they usually develop on the head or forelegs of a dog. Sometimes they are seen on the pads of the dog’s feet, in the nail beds, on the lips or behind and inside the eye. In older dogs, tumors often develop in the nail bed. Sometimes the area will fester and the nail will fall off. In this case, the vet may do a biopsy, taking a sample (including bone) to determine if it is cancer. Melanoma found in the mouth causes the most problems. If your dog has melanoma in his mouth, you may notice that he has very bad breath, trouble chewing his food, food falling out of his mouth, bleeding in his mouth, swelling on one side of his face and possibly unexplained weight loss. Treatment used most often for this type of melanoma is surgery with radiation. Canine melanomas grow quickly, and they can spread to other organs in the body. It is important to get medical treatment early for this kind of cancer. Squamous cell carcinomas are also found commonly in dogs. Older dogs frequently have these tumors develop on their skin on the head, lower legs, tummy or rear. Most squamous cell carcinomas are firm and raised or they are patches of ulcers and lumps. On occasion, a squamous cell carcinoma looks like a wart. This kind of dog cancer can be caused by excessive sun exposure, as when dogs lie on their backs in the sun. In addition, there is some evidence that the papilloma virus can also play a part in development of this type of cancer. However, you do have some warning before squamous cell carcinoma develops. The skin becomes thick and discolored, even before you see any sign of tumors. This is the time to show it to your vet. Just like with people, dogs can get sunburned, and if the sun damage is severe, your dog will be more likely to have skin cancer. Dogs that have light colored hair, a thin coat or those that are hairless, are the most vulnerable to sun exposure. But if your Bichon Frise has thinning hair in spots, because of allergies or other irritations, or you have her hair cut really short, she can get sunburned, too. Even if your dog has a show cut with long hair, her nose can get sunburned. And, if you live in the southern U.S., in Arizona, southern California, Texas, Nevada or New Mexico, your dog is also more likely to get sunburned because of the intense rays of the sun. How is Skin Cancer Diagnosed in Dogs? Your dog’s skin has a number of layers, and each layer can support the growth of cancerous tumors. As you probably already know, Bichon Frises have lots of skin issues. Most commonly, they have skin allergies or food allergies that give them irritated areas of skin with redness, swelling and itching. And, just like other dogs, they sometimes have hot spots. In addition, not every lump or tumor is cancerous. So diagnosis of cancer in your dog can be very difficult. 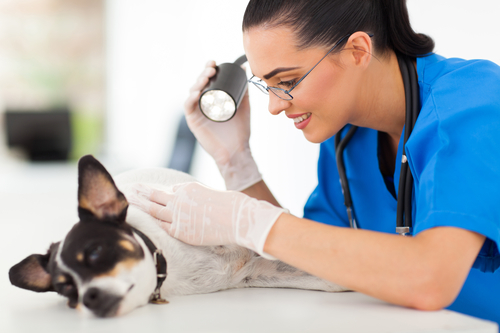 If your dog has a suspicious lump, your vet may perform a fine needle aspiration of the cells (extracting cells with a thin needle) or the vet may do a biopsy (cutting out a small amount of tissue from the lump to examine it under a microscope). Of course you should pay attention to any lump that doesn’t go away in a few days. Bug bites and simple injuries to the skin will go away on their own within a couple of days. As dogs get older, the risks for skin cancer do increase. So, even though most growths or bumps on your dog’s skin are probably benign (not cancerous), do pay attention to each one that you find. Tumors in a dog can be benign (not cancer) or malignant (cancer). But it is really hard to tell the difference when you just look at them. It is very important to see a vet when you discover one or more of the symptoms listed above. Skin cancer can be removed and forgotten, or it may indicate that there is more going on, inside your dog’s body. It can be an indicator of a far more serious cancer internally. Treatment for cancer in dogs is expensive and it will probably require frequent visits to your vet. Decisions about care will depend on the age of your dog and how long your dog is expected to live, and whether he is expected to have a good quality of life. Unfortunately you also have to consider the expenses in time and money that cancer treatment will require. Treatment for skin cancer depends largely on the kind of cancer and where it is located on your dog. Surgery – This is usually the first choice. In many cases, simply removing the cancer is all that is needed. Surgery is especially effective when you discover the cancer early. Chemotherapy – This is a combination of very powerful medications or drugs that are used to kill the offending cancer cells. Chemotherapy also kills healthy cells in your dog’s body, so your dog can become quite ill when going through chemotherapy. Chemotherapy is often used in addition to surgery or radiation therapy. Radiation – used for mast cell tumors in dogs in addition to surgery. Mast cells respond well to radiation therapy if they are treated early. 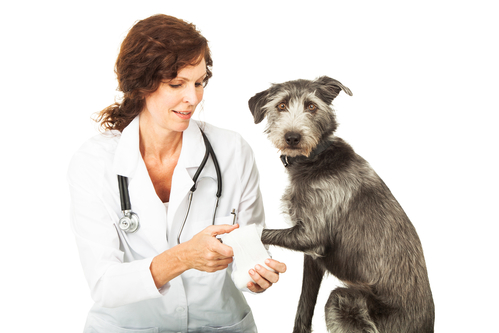 Of course, if your dog has skin cancer, your vet will need to be involved in a big way. Whether the vet decides on using surgery, radiation or chemotherapy to treat your dog, this is not something that you can handle by yourself. But there are things that you can do to help your dog. Long before you have a suspicion of cancer, you can prevent excessive sun exposure to your dog. This does not mean that you have to keep your dog cooped up in the house all the time. She can come outside with you, and there are some simple things that you can do to make sure that she doesn’t get too much sun. A dog T-shirt – Just like you cover up when you are getting too much sun at the beach, your dog can wear a t-shirt to cut down on the sun’s rays. This shirt has a Hawaiian look, but you can get many colors and designs. Canopy over a raised bed – This bed has mesh to allow air flow, even under your pet. The canopy overhead provides shelter from the sun. Dogs naturally find shade when they are hot, and this combination lets you keep your dog outside with you for long periods of time. Pop-up pool and canopy – If you go to the lake or beach where dogs are permitted (or even in your back yard), your dog can lounge in the shade of this canopy, while lying in some cool water. This is quite portable, and it folds and then pops up into place when you need it. If your dog has been diagnosed with skin cancer (or another kind), as frightening and depressing as that can be, there are still some things that you can do to help your dog. Keep in mind that, if your dog has surgery, radiation or chemotherapy, her immune system will be weakened. One way that you can help your dog is to strengthen her immune system to fight both the cancer and the treatments. Immune support supplement – This one seems like a treat to dogs. The important part is to make sure that your dog is getting plenty of antioxidants to support his immune system. Cancer support supplement – Created specifically for dogs with cancer, a cancer support supplement will also help address pain and symptoms, aid immunity, and it will help get rid of toxins that develop with cancer treatments. Because Bichon Frises are prone to getting several types of cancer, it’s wise to examine your dog regularly, to make sure she hasn’t developed any little bumps, lumps or rashes. And, if you do find something, do take her to the vet. Early treatment will always give you the best result!